My friend meant it as a general “life-advice” thing, but since I am an obsessed author/illustrator I interpret it in the context of my writing, reading, researching, publishing and marketing world. My current opportunity, shared with all my fellow authors, is to present that remedy for “being sad”, the “thing that never fails” to our reading audience. Before anyone assumes that the learning has to be sophisticated and profound, be aware that in my case, the audience is 5-8 years old. This group, usually with an adult reading to them, seems fascinated with dinosaurs, construction equipment, and underpants. I recently bought the trifecta to read to my grandson: a picture book about dinosaurs, in their underpants, operating cranes and bulldozers. Needless to say, a big hit. In my own reading escapes, I’m only looking for entertainment, but the unintended byproduct is learning “why the world wags and what wags it”. I never liked history or geography presented academically in school, but since I’m a fan of James A Michener, I couldn’t help but learn about Hawaii, Texas, Colorado (Centennial) Chesapeake Bay (Chesapeake) and Israel (The Source). Since I’m now immersed in researching children’s literature, I’ve come to realize that for the little ones, the learning isn’t just about the subject matter, it’s about the power of communication, the whole palette of adventures they can explore, how the world works, and even their own self-worth. It’s a humbling and very exciting challenge for me! Looking for a good read? New Releases! This was a difficult post to write. It’s been on the to-do list for months while I ruminated. And hedged. And procrastinated. 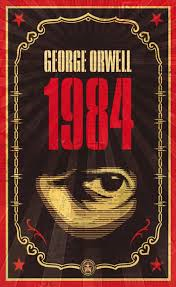 1984 is one of the big boys in the dystopian genre. 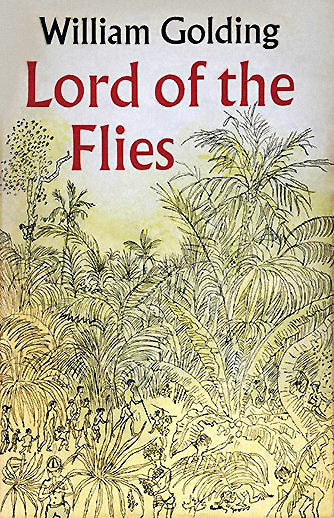 I assume that most of you have read it, or are at least familiar with its theme. 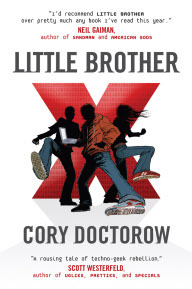 1984 by George Orwell (1949) and Little Brother by Cory Doctorow (2008) are inextricably linked by their subject matter. Both serve as warnings. Both have the power to mesmerize and horrify the reader. Both should make us think. But today, I’m asking you to read Little Brother and think long and hard about what it has to say. 1984 is a classic cry against totalitarian government. It’s easy to assume that Orwell was railing against the post-World War II spread of communism, but he was also warning countries like England and the United States against believing that they could save freedom and democracy by continuing an arms race to find a stable “deterrent.” Orwell asserts that freedom cannot continue to exist in a world preparing for nuclear war. In a world punctuated by war, oppression, deprivation, loneliness, paranoia, and despair, Winston reaches out for truth and love. And pays a terrible cost. Someone went upside my head again. It felt like they used a baton or something—it was harder than anyone had ever hit me in the head before. My eyes swam and watered and I literally couldn’t breathe through the pain. A moment later, I caught my breath, but I didn’t say anything. I’d learned my lesson. Who were these clowns? They weren’t wearing insignia. Maybe they were the terrorists! I’d never really believed in terrorists before—I mean I knew that in the abstract there were terrorists somewhere in the world, but they didn’t really represent any risk to me. There were millions of ways that the world could kill me—starting with getting run down by a drunk burning his way down Valencia—that were infinitely more likely and immediate than terrorists. Terrorists kill a lot fewer people than bathroom falls and accidental electrocutions. Worrying about them always struck me as about as useful as worrying about getting hit by lightning. Marcus soon learns he’s been detained by the Department of Homeland Security as a person of interest in the terrorist attack. Despite the threats made by his captors, Marcus refuses to unlock and uncrypt his cell phone, or give any information to them. He feels that he is a citizen who loves freedom, which makes him the patriot and his captors the traitors. He is detained for five days, and released when he agrees to sign papers that declared he had been held for voluntary questioning. He is then released and told to say nothing of what has happened to him to anyone, even his parents. He is told that he will be under constant surveillance. When he returns to school the following week, he finds things have changed since the terrorist attack. The school board has installed closed circuit televisions in every classroom for the students’ protection. Why did we have cameras in our classrooms now? Terrorists. Of course. Because by blowing up a bridge, terrorists had indicated that schools were next. Somehow that was the conclusion the Board had reached anyway. ”I suppose so.” The class was staring at me. I wasn’t the best student in school, but I did like a good in-class debate. They were waiting to hear what I’d say next. There was some nervous tittering. One of the others put his hand up. It was Charles. Ms. Galvez called on him. ”Safe from what?” I asked, without waiting to be called on. “Terrorism,” Charles said. The others were nodding their heads. “Thank you, both of you,” Ms. Galvez said. She looked really unhappy. Marcus is watched and followed in the days to come. When he finally tells his parents what really happened to him, they are horrified at his ordeal, contact an investigative reporter, and from that moment on, Marcus is in danger. He organizes an event that will bring the overreaching arm of the DHS into the public eye, and things go horribly wrong, causing Marcus’ worst fears to be realized. We are fond of slogans like “Freedom isn’t Free.” We must remember that we win freedom by having the courage to live every day as free people—no matter how big the threats on the horizon. Please don’t give in to fear and paranoia. Don’t forget to be brave. Don’t believe that the things the government does to take away our freedoms are merely a small price to pay for our safety. My publisher suggested Kickstarter to me at an early planning meeting. Dancing Dakini Press, a small but well-established entity, had used this method previously to fund printing of their award-winning books, and promised to guide me through their steps. I was reticent, not fully understanding the “how”. My only exposure to crowdfunding had been a few projects I had seen online, for GoFundMe. I later learned the agenda of GoFundMe, as explained on their website, is to help raise money for “medical expenses, education costs, volunteer programs, youth sports, funerals & memorials – even animals & pets.” It’s obviously not appropriate for us in the book business. The perfect fit for authors is Kickstarter. Their mission statement welcomes entrepreneurs in the fields of art, music, theater, journalism, publishing and technology. Their rules exclude any charity, focusing instead on projects for “creating something and sharing it with the world”. In my opinion, an author must think of the work as bigger than him/herself, and that it will make the world a little better, raising the bar for literary excellence, and/or showcasing an important concept, which in my case was an endangered species. My biggest supporter was my son-in-law, who owns a search engine optimization business, and knows a lot more about marketing than I do. He endorsed my plan, saying that it was vital to have followers sharing the adventure and being part of the success. My publisher recommended that I build my followers list to a minimum of 1 person for every $10 (800 followers for $8000). For me the list comprised Facebook, Twitter, Linked-In, Pinterest, and a business Facebook page I started, named after the book title. 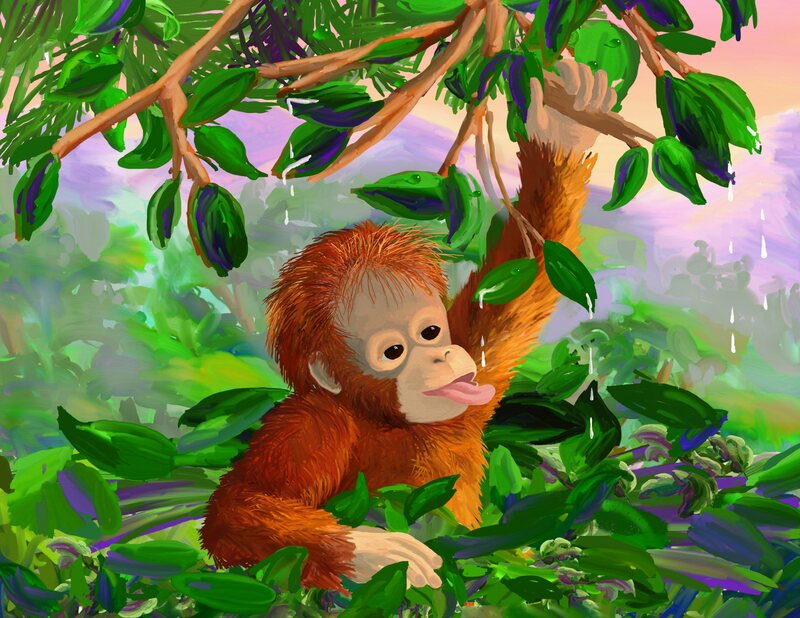 On the business page, one can’t “friend” people, so I increased my list by posting the book illustrations on non-profit organizations’ pages about rainforests, orangutan rescue, etc. 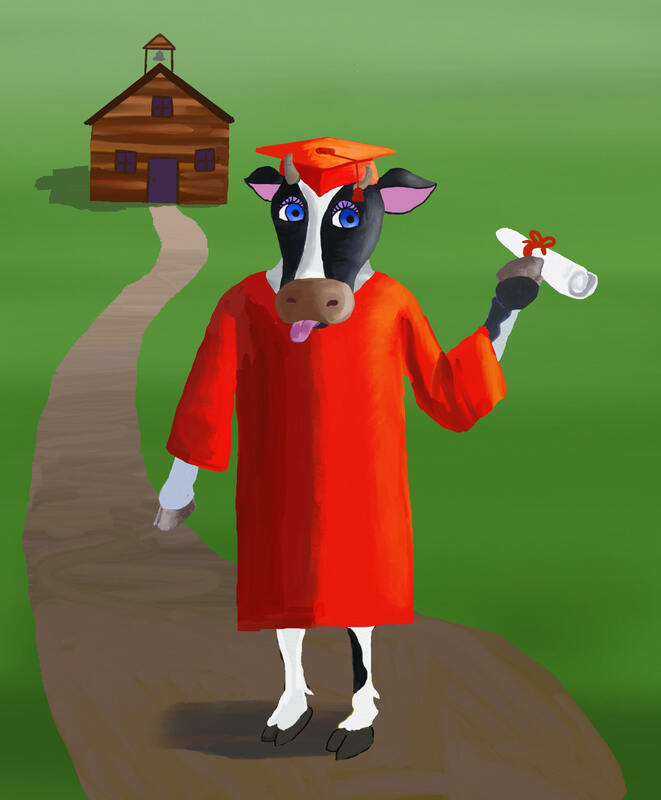 Then I asked people to “like” my business page to see more illustrations. I also occasionally posted a short question on these pages, to elicit a response, and then asked the responders to “like” my business page. One of my questions was “Do you think education or penalties are more effective in stopping wildlife habitat destruction?” I was thrilled to see I got a response from Jane Goodall (my hero) on that one. I started this follower-building two months before the Kickstarter launch. I posted an illustration and/or a comment every other day on the business page, and shared it with all the other social media. I also bought two ads, for 6 days each, $5.00 per day, but I have no way of knowing if the followers were coming from the ads or the posts. Once I launched the campaign, I emailed almost everyone I knew, and posted frequent updates on social media. The prizes for backers have to be something personal, from you. The obvious prize is an autographed book, but I also used notecards and color print enlargements, too. Some authors give lessons for prizes, on plot or character development, pacing, climax, conflict resolution, or any tricks of the trade they’ve learned along the way. It was an exciting (although sometimes bumpy) ride, and I have not only the money to show for it, but a group of interested followers who share my passion. You can see Rita’s campaign here.